LEGO Lone Ranger Silver Mine Shootout features rock detailing, falling skull, secret waterfall entrance, turning crane and boulder launch function, exploding rocks functions, cart with quick escape function and a dynamite catapult launcher. Includes 5 minifigures with weapons and accessories…. Sneak up on Butch Cavendish and his bandit buddy as you help the Lone Ranger, Tonto and Chief Big Bear ambush the gang and reclaim the silver. LEGO model number: 79110: Enter through the secret waterfall, climb the ladder up to the crane, send the boulder flying and fire the exploding rock as you battle to get out of the mine with the treasure. Load everyone into the cart and launch the dynamite into the air with the catapult to make your escape. Includes the Dusty Lone Ranger and Tonto, Chief Big Bear, Butch Cavendish, Skinny Kyle the bandit, 3 revolvers, a rifle, a tomahawk and a bow with quiver. For ages 9 years and over; EAN: 5702014972568. WARNING(S): Not suitable for children under 3 years old. To be used under the direct supervision of an adult. 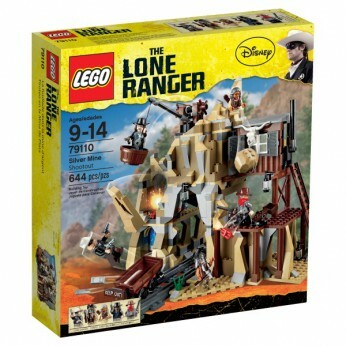 Get ready for some Wild West action with the Lego Lone Ranger Silver Mine Shootout 79110. Help the Lone Ranger, Tonto and Chief Big Bear take back the silver from Butch Cavendish and his bandit buddy. Sneak through the secret waterfall entrance and climb up the ladder. Then lower the crane’s bucket and reclaim the loot! Escape through the trap door, slide down the shoot and make a quick getaway in the cart. But watch out for the flying boulder and exploding rocks! This highly detailed set features 644 pieces and includes: 5 x Mini figures: the Lone Ranger, Tonto, Chief Big Bear, Butch Cavendish and Skinny Kyle Weapons: 3 revolvers, rifle, tomahawk and a bow with quiver Accessories: barrel, 3 dynamite, ladder, shovel and a pick Silver mine with exploding rocks, boulder launch function, trapdoor, falling skull, secret waterfall entrance, turning crane, lowering bucket, cart and dynamite catapult launcher Great for kids aged nine and up. This toy costs approximately £65.99 (for the latest and best prices make sure you check our retailer list for the LEGO The Lone Ranger Silver Mine Shootout 79110 above). In our review of LEGO The Lone Ranger Silver Mine Shootout 79110 we classed it as being suitable for ages 6 years, 7 years, 8 years, 9 years, over 10 years but recommend you check the manufacturer specific advice before purchasing.